I think it is a bug because I can't scroll down to AAC Decoder settings or any other settings below. Any suggestions how can I get to these other settings? Sorry don't know a workaround (yet). It seems that BSPlayer's codec manager download an ancient version of MPA decoder (ver 1.0.0.4) released by gabest probably around 2006-2007. Download and install, probably the bug is gone by now. I am using an older version (1.0) for many years and had no problem at all. I think the version loaded by BS.Player's codecmanager is Gabest last "official" version. Apparently you didn't test and try yourself! Version 1.6.3.5588 as referred to by you doesn't solve makimakimaki's reported issue. In fact it instead adds new problems (see text below the picture). This new version seems stripped down and simply doesn't cover AAC-audio as you can see from the picture below. (Most probably BS.Player in its default installation uses FFDShow for AAC. I didn't test that now though.) Codecmanager indicates in its info that this filter is an "Alternate audio decoder for AC3/DTS and MPEG audio", which also suggests that BS.Player doesn't use it for any other purposes (such as AAC). So perhaps this issue in fact is only a cosmetical issue which could (?) maybe easily be repaired by slightly shortening (=moving bottom border up) the window shown for MPA Decoder's properties. When (easy method: quick and dirty) testing this newer (but non-Gabest!) version, I played several movies and quite a few gave errors, whereas they played without any problems with the "old" MPA Decoder filter. (Also afterwards when I went back to version 1.0.0.4.) So that is IMHO a very good and valid reason to stick to the "old". Unfortunately, on Gabest SF.net page, the same issue (can't scroll down) was reported somwhere in 2008 and no response since then. So I cannot but think that the issue reported is just a cosmetical remnant of this older (but discontinued) GUI. As meanwhile may have become clear, this doesn't - in fact - concern a bug in BS.Player, but rather a cosmetical issue of the filter itself (though maybe it is possible (I don't know) for BS.Player's developper(s) to bring the window's bottom border e.g. one mm up, so that the filter's obsolete text becomes hidden). 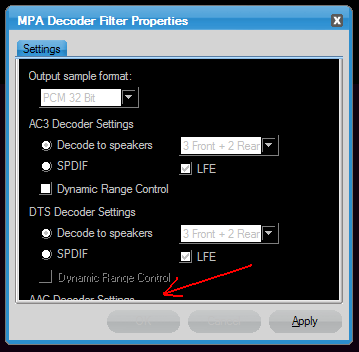 BS.Player doesn't rely on MPA decoder for AAC audio, but instead I expect that (in BS.Player's default installation, with only its preferred codecs/filters installed) it will use ffdshow Audio decoder to take care of AAC audio.